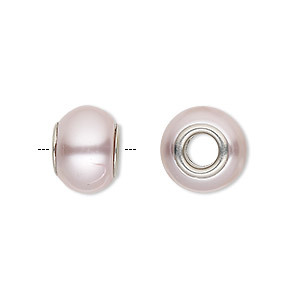 Bead, Dione®, glass pearl and silver-plated brass grommets, pink, 12x10mm-14x10mm rondelle, 4.5-5mm hole. Sold per pkg of 4. 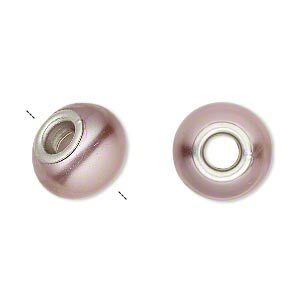 Bead, Dione®, glass pearl with silver-plated brass grommets, mauve, 12x10mm-14x10mm rondelle, 4.5-5mm hole. Sold per pkg of 4. 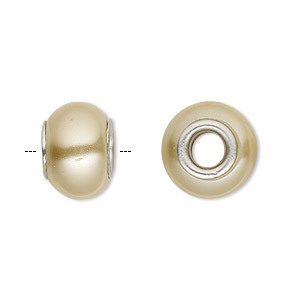 Bead, Dione®, glass pearl and silver-plated brass grommets, yellow, 12x10mm-14x10mm rondelle, 4.5-5mm hole. Sold per pkg of 4.